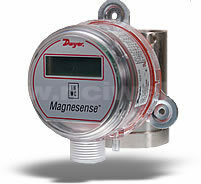 The Series MS Magnesense™ Differential Pressure Transmitter is an extremely versatile transmitter for monitoring pressure and air velocity. This compact package is loaded with features such as: field selectable English or metric ranges, field upgradeable LCD display, adjustable dampening of output signal (with optional display) and the ability to select a square root output for use with Pitot tubes and other similar flow sensors. Along with these features, the magnetic sensing technology provides exceptional long term performance and enables the Magnesense™ to be the solution for a myriad of pressure and flow applications. Service: Air and non-combustible compatible gases. Accuracy: MS-X21: 0.5" w.c. & 0.25" w.c.: ±1%; 0.1" w.c.: ±2%; 100 Pa & 50 Pa: ±1%; 25 Pa: ±2%. MS-X11: 5" w.c. & 2" w.c.: ±1%; 1" w.c.: ±2%; 1000 Pa & 500 Pa: ±1%; 200 Pa: ±2% (@ standard conditions). Temperature Limits: 0 to 150°F (-18 to 66°C). Pressure Limits: 1 psi maximum, operation; 10 psi, burst. Power Requirements: 10 to 35 VDC (2-wire); 17 to 36 VDC or isolated 21.6 to 33 VAC (3-wire). Output Signals: 4 to 20 mA (2-wire); 0 to 10 V (3-wire). Response Time: Field adjustable 0.5 to 15 sec. time constant. Provides a 95% response time of 1.5 to 45 seconds. Zero & Span Adjustments: Digital push button. Loop Resistance: Current Output: 0-1250 max. Voltage Output: min. load resistance 1 k.
Display (optional): 4 digit LCD. Electrical Connections: 4-20 mA, 2-wire: European Style Terminal Block for 16 to 26 AWG. 0-10 V, 3-wire: European Style Terminal Block 16 to 22 AWG. Electrical Entry: 1/2" NPS Thread. Accessory: Cable Gland for 5 to 10 mm diameter cable. Process Connection: 3/16" (5 mm) ID tubing. Maximum OD 9 mm. Mounting Orientation: Diaphragm in vertical position. Weight: 8.0 oz (230 g). Field Upgradeable LCD. No need to order two separate transmitters. Simply stock a transmitter and display and you can satisfy any customer's requests. Simply remove cover and snap the LCD onto the board. Field Selectable Ranges in metric or English. Lowers stock and inventory requirements. You'll always have the right transmitter for every job. Digital Push Button Zero and Span. Reduces calibration time significantly over other transmitters that utilize potentiometers. Lowers maintenance time and costs. Adjustable Digital Dampening smooths out unstable pressure fluctuations common in air flow applications. 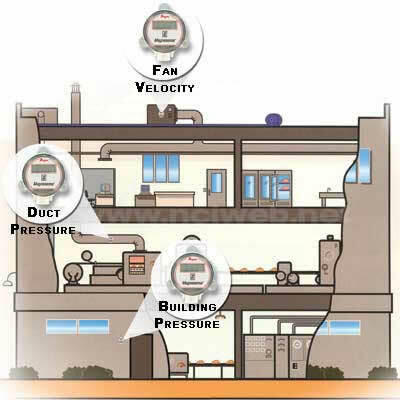 Field Selectable Air Velocity Mode for fan and blower applications. Unit provides square root output that accurately tracks fpm or m/s flow rate. 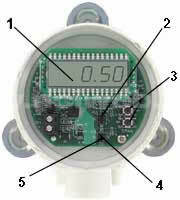 No need for a smart programmable indicator or PLC to convert pressure to air flow. Reduces components and installation time lowering overall costs.